Here they go again, a bevy of the so-called experts, making predictions about the climate which they cannot possibly justify. It's all going to go belly-up by the year 2200 they tell us – in no less than 190 years, when the global climate "is more than likely to slip into an unpredictable state with unknown consequences for human societies". This is, of course, "if carbon dioxide emissions continue on their present course". Almost all of the leading researchers who took part in a detailed analysis of their expert opinion believe that high levels of greenhouse gases will cause a fundamental shift in the global climate system – a tipping point – with potentially far-reaching consequences. Yea, right. And next week's weather is? Er, sorry – I forgot, weather isn't climate, but they can predict neither with any confidence, much less telling us what the climate is going to be in nearly two centuries' time. 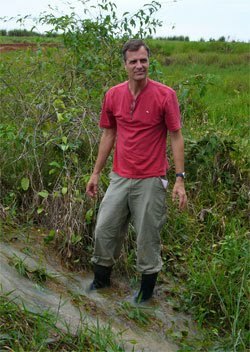 Meanwhile, I have been ferreting around on the Monbiot case and just one of the little delights I have stumbled on is a claim by Daniel Nepstad (pictured) in 2005, in a publication called "Tropical Deforestation and Climate Change". In it, Nepstad and his pals predict a reduction in "mature" Amazon forest of between 15% and 40% - the top level being, it seems, just what the IPCC was asserting. But while the IPCC was putting the decline down to a slight reduction in precipitation, Nepstad does no such thing. All the studies he looks at – he tells us - demonstrate that "fire provokes significant reductions in the total biomass". The scale of reduction is, he says, "directly related to the intensity of logging, the intensity of drought, and the occurrence of previous fire between an unburned forest (undisturbed) and a logged and burned or just burned forest." And this is precisely the point – that the threat to the forest is multifactorial, that drought is only one factor and that, for drought to be significant it must be severe and prolonged. Thus, in 2005, Nepstad is not supporting the IPCC thesis. In 2008, he is then saying that using his "deforestation model," and projected out the year 2030 using current climate patterns, he finds by the year 2030, "55 percent of the forest will be either cleared or damaged" — 31 percent cleared and 24 percent damaged by either logging or drought, with a large portion of that damaged forest catching fire. Once again, this does not support the IPCC's 40 percent claim – or anything like it. Yet, two years later Nepstad is saying that "the IPCC statement on the Amazon was correct", and the WWF claiming that support for the thesis comes from Nepstad – in 1999. And what does the 1999 work say? Well now, that is where it gets really interesting. I'll post on that later today, when I've put all the bits together – but it knocks Monbiot and The Sunday Times into a cocked hat, or a rather nasty little "tipping point" of our own. Getting a "living corpse to walk"
Just what is wrong with us? Is this how they see us? The second one is "off"